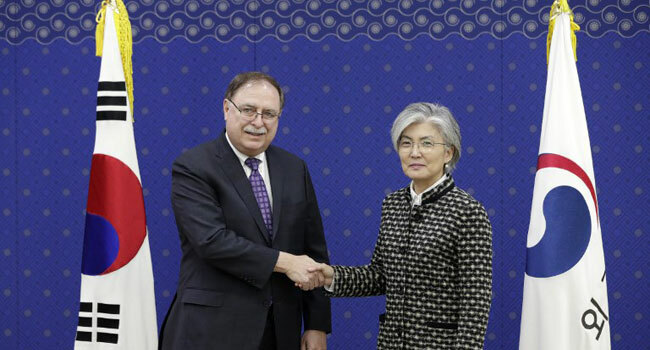 South Korean Foreign Minister Kang Kyung-Wha (R) and Timothy Betts, acting Deputy Assistant Secretary and Senior Advisor for Security Negotiations and Agreements in the US Department of State, shake hands before their meeting at Foreign Ministry in Seoul on February 10, 2019. Seoul announced on Sunday that it has agreed to hike its payment for maintaining American troops on its soil, settling a dispute with its longtime ally ahead of a second summit between the United States and North Korea. The two countries have been in a security alliance since the 1950-53 Korean war, which ended with an armistice rather than a peace treaty — with more than 28,000 US troops stationed in the South to guard against threats from Pyongyang. But US President Donald Trump has repeatedly complained about the expense of keeping American forces on the peninsula, with Washington reportedly asking Seoul to double its contribution toward costs. The negotiations ended with South Korea’s foreign ministry saying Seoul will pay about 1.04 trillion won (US$924 million) in 2019, 8.2 per cent more than what is offered under a previous five-year pact which expired at the end of last year. The ministry said that although the US had demanded a “huge increase” in payment, they were able to reach an agreement that reflects “the security situation of the Korean peninsula”. “The two countries reaffirmed… the importance of a strong South Korea-US alliance and the need for a stable stationing of the US troops,” it said in a statement issued after a signing ceremony. The row had raised concern that Trump may use it as an excuse for US withdrawal. The US president and North Korean leader Kim Jong Un are expected to discuss an official declaration to end the decades-old war — a prelude to a peace treaty — at their second summit in Hanoi later this month. At their first meeting in Singapore last year, the notoriously unpredictable US president had made a shock decision to suspend US-South Korea military drills. Since the deal is only valid for one year, the two sides may soon have to return to the negotiating table. Seoul contributed around 960 billion won last year — more than 40 per cent of the total bill — financing the construction of American military facilities and paying South Korean civilians working on US bases. The deal will officially go into effect after it receives parliamentary approval in South Korea, which is expected to take place in April, according to Yonhap news agency.